Last month I read a moving essay by Monica Bhide, published in Bon Appetit magazine, “Save Your Recipes, Before It’s Too Late.” In essence, it was the personal tale of how a poignant cookbook and a trip around the world taught a burned-out food writer the true meaning of cooking, eating, and family. Burned out? In search of meaning? Yes, I can relate to those feelings. 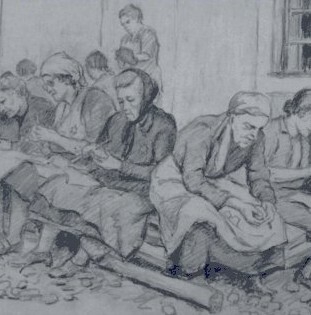 The book providing inspiration to Ms. Bhide was “In Memory’s Kitchen,” a compilation of recipes written by women at the Terezín concentration camp in Czechoslovakia during the Third Reich. A very powerful book. 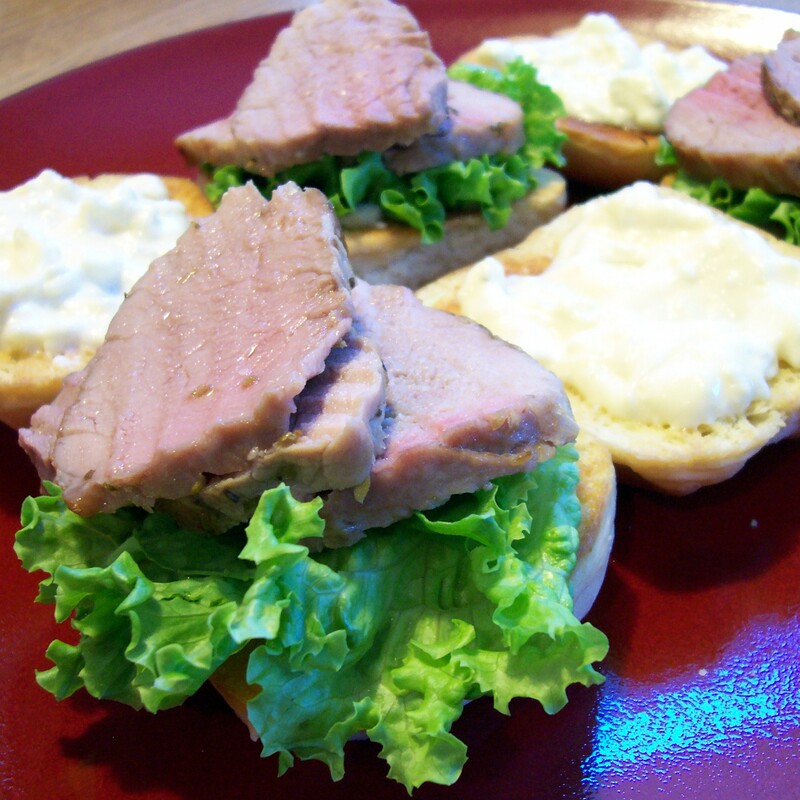 If you missed our Oscar’s evening buffet, you missed a chance to sample these juicy – but dainty – pork tenderloin sandwiches, each draped provocatively in feta aioli. But unlike the luxurious Oscar gowns adorning the red carpet, these luxe little creations can easily be replicated in the privacy of your own home. As with all prime time events, advance planning is necessary and preparation of this dish should begin a day in advance. Don’t fret — the steps are easy and time itself will do most of the advance work for you. Scents of garlic and oregano will perfume the air while the marinade is prepared, aromas that – at least for some of us – are far more alluring than the most expensive Oscar-worthy perfumes. Snowy winter weather calls for comfort food, and at the top of my list are roasts and slow-braised dishes. If you live in Alaska, where we only half joke that it’s winter 7 months out of the year, then you can never have too many savory comfort recipes in your repertoire! Jeff Johnson from the HomeGrown Market in Fairbanks mentioned that his special today was beef short ribs. 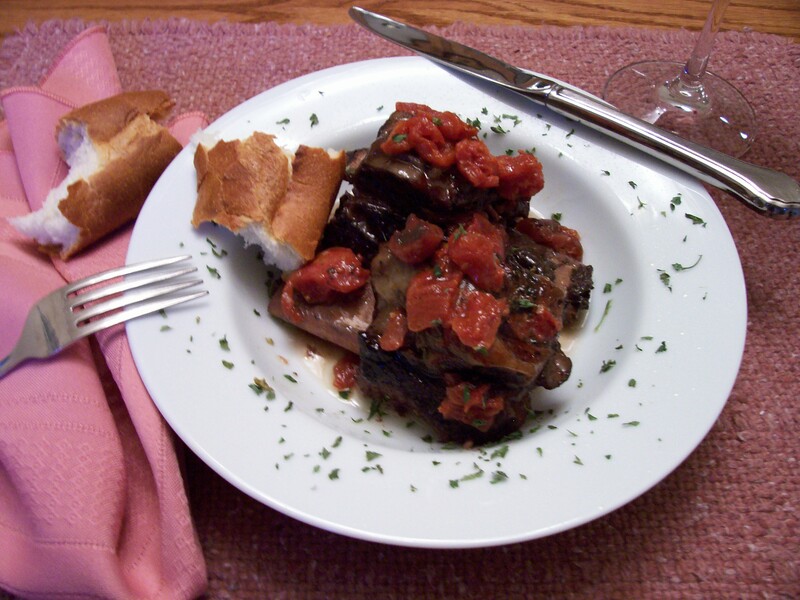 His special prompted me to recall a dish I prepared last fall, a meltingly tender version of braised short ribs. It was yummy during those chilly autumn days — and it will be even better when staving off the biting cold of a wintry Anchorage evening. In my kitchen right now, beef short ribs are braising in a savory broth with red wine, diced tomatoes, onion, and garlic. The house is filled with the wonderful aroma of this slow-cooking delight that is surely going to warm up this otherwise dreary winter day. There’s fresh bread from the Fire Island Rustic Bakery standing by for duty. Beside it is a spicy Australian shiraz, the D’Arenberg Stump Jump, that I think will be a fine match for the rich beef. (See the Frozen Grape’s “Wine of the Week” blog post.) Salute! January is the traditional time when people make resolutions to eat healthier following a holiday season filled with rich food. My philosophy is different — I live to eat, so I want to have great food all of the time. Resolve to ingest a diet of unsweetened yogurt and boiled quinoa for a month? Not me! Bring on flavorful decadent cuisine, just eat it in moderation throughout the year. Pork is one of my favorite comfort foods, rich and succulent, with a bit of naughty fat for delicious flavor. Next week I’m heading to Fairbanks where Jeff, the owner of the HomeGrown Market, has the best Alaska grown pork in the entire state. 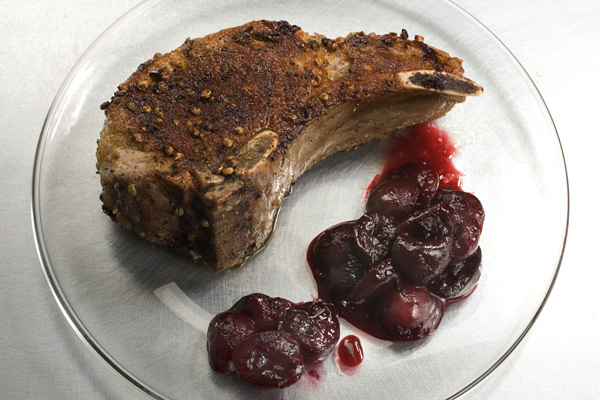 I have dreams about his luscious pork chops … and this recipe is at the top of my current “must-cook” list. Yesterday friends and I were comparing our salmon recipes and reached the consensus that there are far more salmon recipes than there are cooks in Alaska. We also agreed that many commercial salmon-bakes fail for one simple reason – the fish is overcooked, it dries out, and the flavor of the salmon is lost. This is one reason many visitors to Alaska think they don’t like salmon. 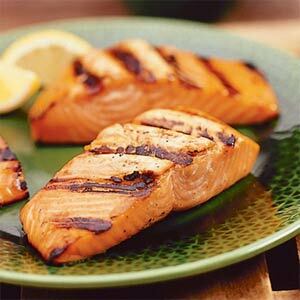 A good basting sauce is one trick that helps keep salmon moist. There are many variations for a Southeast Alaska salmon-bake, but this recipe from the Taku Lodge south of Juneau is considered a classic. Here it’s been tweaked to create a marinade for the fish that then doubles as the basting sauce. I recommend using a good quality white wine for the marinade and basting sauce, but I prefer to serve the salmon paired with a nice Oregon pinot noir. Cedar planks are the preferred choice, but you can experiment with other aromatic woods such as apple or hickory. The glaze on the salmon gives the fish a bit of sweetness counter-balanced with a touch of heat. This is a very popular Southeast Alaska recipe for halibut. Local legend is that the original recipe was created back in the 1920s by a woman named Caddy Ganty, the wife of a fish packer living in the small fishing community of Pelican. Many restaurants in Alaska and the Pacific Northwest serve a variation of this dish, sometimes calling it Halibut Olympia. Perhaps the most well known version is served at the Gustavus Inn near Glacier Bay National Park. The Inn won an “America’s Classics” award bestowed by the James Beard Foundation in 2010. I adapted this recipe from the one served by JoAnn and David Lesh, owners of the Gustavus Inn.